US-based Buck Mason are committed to crafting clothing that outlives trends, weathers use and wears true-to-character. Endurance, fit and quality is the definition of style for this brand. With Big Apple Buddy’s personal shopping service, you can now buy direct from the Buck Mason online store anytime, anywhere. The Buck Mason 12-Month Wash Slim Stretch Jeans are crafted from a blend of Japanese stretch denim and finished off with nickel hardware and copper rivets. The flexible fabric, make these the most comfortable jeans you'll ever wear or ever want. 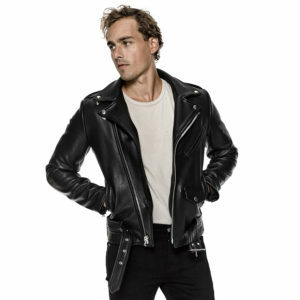 A classic, quality leather jacket is an essential investment for your wardrobe, and the Buck Mason Moto Jacket is one of the finest — Its features include 6 ounce calf in a soft shine, with lightly pebbled grain, interior pocket, and a quilted lining to keep you warm. The Buck Mason Fisherman's Pullover is a rugged traditional sweater that will always be in style and last for generations. Heavy gauge merino wool will keep you warm and cozy from the elements. Unfortunately, the USA Buck Mason online store does not currently offer international shipping. However, Big Apple Buddy, your personal shopper, can help you buy products direct from the official USA Buck Mason online store and ship them to your doorstep, no matter where you are in the world. If you would like to buy from the USA Buck Mason online store, simply let us know which items you would like to order (by filling out the form below) and we’ll get back to you with a free international shipping quote within 24 hours!